I got interested in BYD when I read about Reva promoter & CEO Chetan Maini mentioning about Warren Buffett’s investment in an EV company. Maini recently sold Reva to M&M because he sees market is getting ready for electric cars and Reva needed a father with deeper pockets and farther reach. I thought, “Why would Buffett, who is so averse to investing in technology innovation, invest in an electric car company? What is so special about this company that it has managed to do to Buffett what Intel, Microsoft and Google couldn’t do?” As I started browsing through the Net, a few answers started presenting themselves. Let’s start with the company: BYD. Interestingly, BYD was started around the same time as Reva Motors, in 1995. Reva has put around 3500 cars on the road so far since 2001. In contrast, BYD’s F3, a 4-door compact car that retails for about $9300, has sold 448,397 units in 2009 alone (just for comparison Nano has put 35000 cars on the road since July 2009). But BYD didn’t start as a car maker. Wang Chuan-Fu, a chemist and a government researcher, started BYD in Shenzhen to manufacture rechargeable batteries to compete with imports from Sony and Sanyo. He raised $300,000 from relatives and rented 2000 square meters of space. By 2000, BYD had become one of the world’s largest makers of cellphone batteries. BYD’s customers included Nokia, Motorola, Sony Ericosson and Samsung (was anyone else there?). Today BYD makes about 80% of Motorola's RAZR handsets, as well as batteries for iPods and iPhones and low-cost computers. Revenue, which has grown by about 45% annually during the past five years, has reached $4 billion in 2008. Wang entered the automobile business in 2003 by buying a Chinese state-owned car company that was all but defunct. He knew very little about making cars but proved to be a quick study. In October 2009 BYD’s F3 became the bestselling sedan in China, topping well-known brands like the Volkswagen Jetta and Toyota Corolla. Today BYD employs 130,000 people in 11 factories, eight in China and one each in India, Hungary, and Romania. Essentially Wang is doing to electric vehicles what Henry Ford did to automobiles – making it a product affordable to mass market. Let’s come back to Buffett. Well, it turns out that the investment idea didn’t originate with Buffett. So it’s not as though Buffett suddenly started understanding technology at the ripe age of 78. The idea came from Buffett’s friend and longtime partner 85-year old Charlie Munger. Apparently Munger seems to have sold the man behind technology harder. Munger says, “This guy [Wang] is a combination of Thomas Edison and Jack Welch”. A master problem solver and a master executor – a deadly combination. Buffett sent another trusted partner David Sokol, chairman of a Berkshire-owned utility company called MidAmerican Energy, to travel to China and take a closer look at BYD. “I don't know a thing about cellphones or batteries," Buffett admits. "And I don't know how cars work." But, he adds, "Charlie Munger and Dave Sokol are smart guys, and they do understand it. And there's no question that what's been accomplished since 1995 at BYD is extraordinary." BYD investment has already given Buffett’s Berkshire a 500% returns in less than 1 year. Yesterday Daimler announced its partnership with BYD and an investment of $88 million for product development. In 2010, BusinessWeek ranked BYD the 8th most innovative company in the world, ahead of Ford; Volkswagen and BMW. I guess Bill Gates didn’t sell hard enough when he suggested Buffett to invest in Microsoft and Intel back in 1991. Did I mention that Buffett is planning to visit India next March? 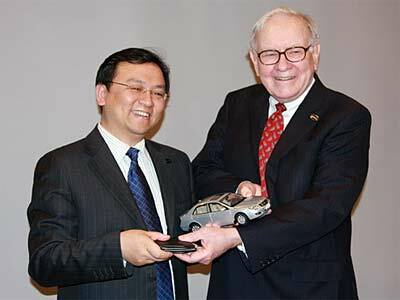 Sources: Warren Buffett takes charge from CNNMoney.com, Buffett’s BYD soars by Lauren Cooper, BYD CEO Wang’s interview on YouTube. In a tragic incident at the New Delhi railway station last Sunday, last minute change of platform for two Bihar-bound trains triggered a stampede, leaving two dead and a dozen people injured. Mamata Banerjee, India’s railway minister, says, “It is not a failure of administration. People are responsible for such chaos." Mamata Banerjee’s knee-jerk reaction to this incident is, in fact, a common phenomena known in psychology as “Fundamental Attribution Error”. It says we have a systematic tendency to ignore the situational forces that shape other people’s behavior. However, the fact is - What looks like a people problem is often a situation problem. Is it possible to look at the situation that caused this tragedy? And is it possible to improve things at the platform so that chances of such a tragedy are reduced not only in Delhi station but all stations in India? 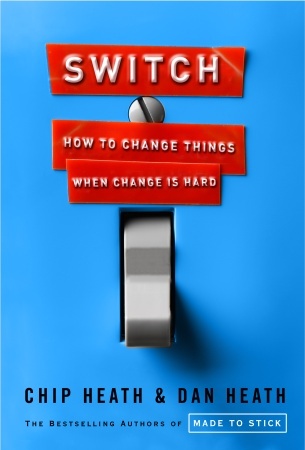 The book “Switch: How to change things when change is hard” written by two brothers, Chip & Dan Heath, gives us a hope. In fact, the book gives a lot more than just a hope. It is gives a sound framework which is actionable. Switch is a book to help you change things. It considers change at every level – individual, organizational and societal. May be you want to help your brother beat his gambling addiction. May be you need your team to become more innovative. May be you want to reduce stampede injuries in temples and railway stations. Heath brothers point out that the underlying principles in all kinds of changes are the same. It involves the same mission: Can you get people to start behaving in a new way? Unfortunately, we all have a built-in schizophrenia. One size of the brain is emotional and the other side is rational. And most problems arise because the two sides often don’t agree. One of my favorite stories from the book is about a social worker, Jerry Sternin. In 1990 Sternin working for Save the Children, the international organization that helps children in need, arrived in Vietnam to help the country fight malnutrition. The minister told Sternin, “You have six months to make a difference”. Sternin did not get into solving the root-causes like the poor sanitation, poverty, education etc. Instead, he mobilized village moms into finding kids who are poor & healthy. Then he asked, “What are the moms of these kids doing differently?” It turned out that the poor-and-healthy-kids moms were doing a few things differently. One, they were feeding their kids four meals a day (using the same amount of food as the other moms). Two, they were proactively feeding their kids rather than letting the kids decide how much to eat. Three, they were feeding different kinds of food – tiny shrimps and crabs from the rice paddies and mixing them with rice. With this knowledge, Sternin designed a community program in which fifty malnourished families, in groups of ten, would meet at a hut each day and prepare food. The families were required to bring shrimp, crabs and sweet-potato greens. The mothers washed their hands with soap and cooked the meal together. Sternin says, “The moms were acting their way into a new way of thinking”. Six months after Sternin had come to Vietnamese village, 65 percent of the kids were better nourished and stayed it that way. Heath brothers call Sternin’s method “Follow the bright spots”. It asks the question, “What is working already? And can we do more of it?” Perhaps a solution to Mamata Banarjee’s railway station stampede problem already resides in Chennai or Kolkata or Mumbai. Like Sternin, we may have to find the bright spots first. Switch gives several techniques such as “Follow the bright spots” in bringing about a change. There are several resources including the first chapter of the book available free at Heath brothers’ web-site. 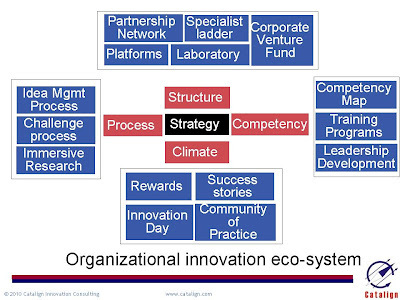 I consider change management to be one of the three pillars of systematic innovation. I won’t be surprised if Switch becomes one of my textbooks. I have mentioned earlier that experimentation is at the heart of systematic innovation. We can imagine building prototypes when it comes to new products such as iPod or Nano. But what kinds of experiments are involved when you are launching a new service? Well, one dimension where you need to experiment is called “customer experience”. How does an experiment for a service look like? Let’s see one such experiment that crystallized the vision for Deccan Aviation – a pioneer in low-cost airline business in India. 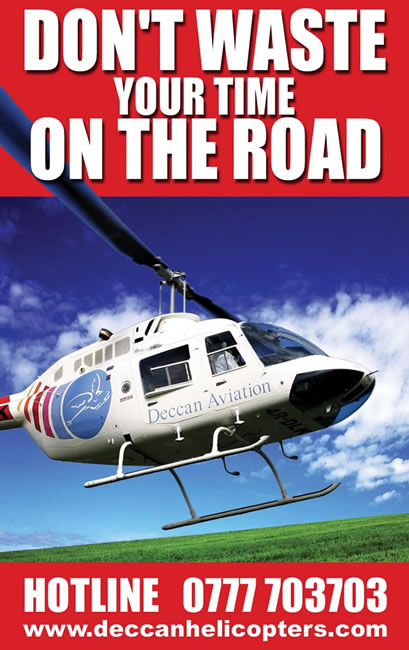 Deccan Aviation was registered in Bangalore in May 1995 by Captain Gopinath and his friend Sam with a vision of, “Getting a helicopter easier than finding a taxi”. There were a number of questions yet to be answered. Can helicopter be brought to the sphere of public use? Could we make it possible for just about anyone to fly – and at a short notice? Gopinath soon got a chance to verify this assumption. One day an old army friend Capt. Vishnu called Gopinath. Vishnu was nick named “Flying saucer” because of his passion for flying. After 15-20 years of service typical pilots do 1,500 to 2,000 hours of flying. Vishnu had done 6,000. He had quit the army and joined the UP government as a helicopter pilot. Vishnu was in Bangalore to fly a UP government helicopter that had been brought to HAL for routine maintenance. He was to take off the following day and offered Gopinath a joy-ride. Gopinath asked him which route he was taking to go back. Vishnu said he would be doing a zig-zag detour – Mangalore, Goa, Pune, Nagpur and on to Lucknow. Gopinath realized that the route is going over his village near Hassan. Gopinath requested if Vishnu could drop him to his farm-house on the way and whether he could get his wife Bhargavi and as well as his friend Jayanth and his wife Ponnu with them. Vishnu happily agreed. In preparation for the landing on the farm, Vishnu asked for a field to be cleared and a fire lit up to help him locate the smoke and find the landing spot as also the direction of the wind. 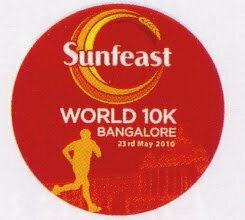 Gopinath called his village friend Raju in Javagal and asked him to make the necessary preparations for their arrival the following morning. They all took off at 9:30 am in Chetak, a helicopter made by HAL under French license and offering 180 degrees aerial view. Vishnu asked Gopinath to sit next to him in the cockpit to help with micro-navigation when they approach Javagal. He sat with his map spread out on his lap. Within fifty minutes the helicopter reached the farm-house. Raju had lit a fire in a nearby ragi patch from which smoke was visible. A host of neighbors and many others in the village were crowded around the patch. It was the first time in their life they were going to watch a helicopter from such a close distance. As soon as they alighted Raju brought them tender coconut to drink. What happened here? First one is that an opportunity landed on Gopinath’s feet for a joy-ride, a lucky break. But what Gopinath did was to convert the opportunity into an experience that will validate his assumption about “flying to a small village on a short notice”. This was no ordinary experiment. For a person dreaming about starting a helicopter charter service, it was an ultra-low cost experiment. Low cost experiments like these are extremely important in systematic innovation because they help you validate various assumptions about your idea. They help you course-correct and they enable you to fail and learn from the failures. Why does Geoffrey Moore say, “Being innovative is not the goal”? I sell innovativeness. In fact, I promise my customers that I can help them become more innovative. And hence, when Geoffrey Moore says, “Being innovative is not the goal”, I want to know why? 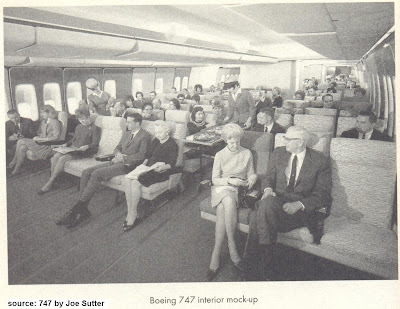 · No sixer: I have seen organizations whose innovation programs are several years old. Thousands of ideas are generated and several of them are implemented. But there is only one catch – all the ideas are incremental in nature. They haven’t had a sixer and in fact, there is nothing in the pipeline which can potentially be a sixer. If you take a parameter like “idea per person” the organization may claim “innovativeness” but such “innovativeness” is not good enough. 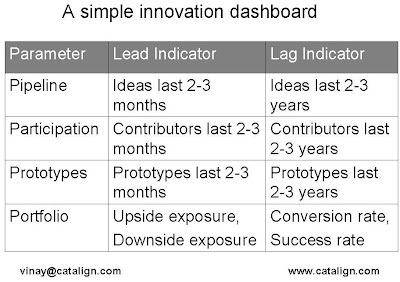 In the innovation dashboard I presented earlier, such a situation will result in a poor “portfolio”. · Inefficient innovation: We have seen earlier the story of an innovative company – Lego that forgot the cost of innovation. In 2003, Lego was churning out new products but at what cost? The company designers were dreaming up new toys without factoring in the price of materials or the costs of production. For example, a pirate kit included eight pirates with 10 types of legs in different attire and positions. Lego group had 11,000 suppliers, nearly twice as many suppliers as Boeing uses to build its aircrafts. Lego was certainly trying to be innovative but not being competitive. 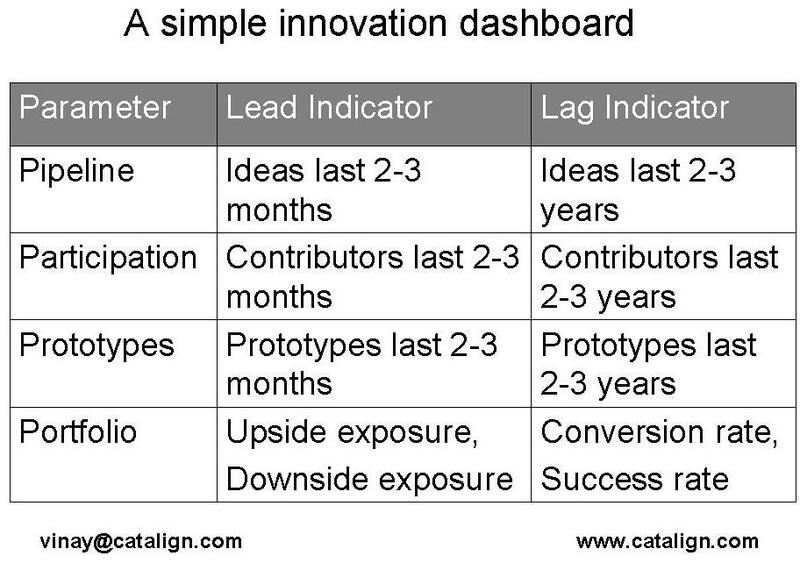 In the innovation dashboard, such a situation will result in poor “success rate” when success is measured in terms of profitability of the new products. What can we do so that we don't forget the end-goal? We devise a strategy – a broad approach to “where to play? 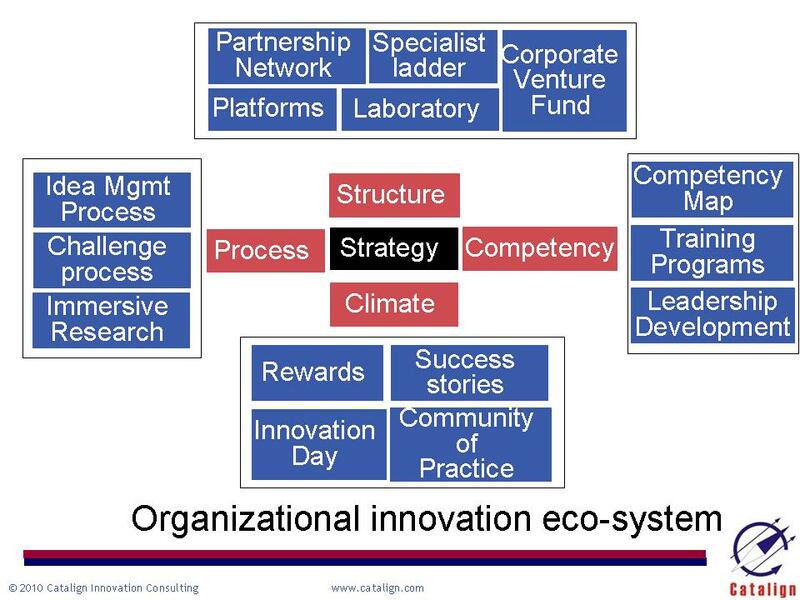 And how to win?” And I feel it should be an important element of your innovation ecosystem. And not losing sight of the ultimate goal matters.